Using a sports continuum to teach Lessons for Life. The next session for sports leagues and classes begins the week of June 10—registration opens April 25. The YMCA’s sports continuum works to reduce barriers so all kids can participate and have a place on the team. The Y measures success on personal improvement, not wins and losses. YMCA sports brings fun back into the game while teaching valuable lessons for life. Sports Camps & Clinics: A stress free environment to introduce kids of all ages to new sports. At this stage, we focus on exploration and getting kids in the healthy habit of moving. Classes: The best athletes come from multi-sport backgrounds. YMCA classes provide an entry point to build sports literacy through active play for all kids. This stage of the continuum also serves as a place to build desire around trying new sports. Kids develop confidence as they acquire hard and soft sports skills. The YMCA’s approach increases their success when they move to the next stage of game play with sports leagues. Leagues: Putting positive competition and scored games into play, kids learn the importance of winning, loosing and having respect for their teammates and their opponents. In our leagues, sports coaches help bring out the potential in every child. Sports leagues intentionally start at grade 2 when kids are developmentally ready to maximize team play. Sports training: Kids can take their acquired skills to their highest potential with Sports Training. Our training program and professional trainers, help athletes build individual confidence and skills outside of a team setting. Childhood obesity is on the rise. Less than half of children ages 6 – 11 meet the U.S. Surgeon General’s recommendation for engaging in at least 60 minutes of moderate physical activity most days of the week. Sports activity can address this deficit however nationally; sports participation is down. And with less participation, there’s less movement. The problem affects some groups more than others and most often starts during the grade-school years. Kids need a new measure of success focused on personal improvement. The Y creates opportunities to include kids at every age and every stage so all may thrive. The Y’s sports model creates a life-long connection to sports and active lifestyles while reducing access barriers. 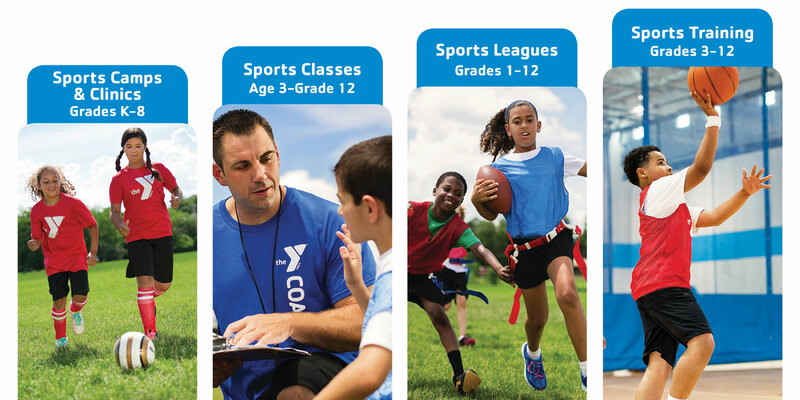 The Y encourages sports sampling; more options mean more kids will find a sport they enjoy. The Y also recognizes the importance of competition, skill development and self-improvement while using it as an opportunity to build confidence and teach lessons for life. Seven Pillars of YMCA Sports: represents guiding principles found in all Y sports. Everyone Plays - In Y Sports, there are no tryouts and no one gets cut from teams. Everyone who registers is assigned to a team and all players have the opportunity for equal playing time in games, teaching participants valuable social and teamwork skills and contributing to a healthier community. All players participate throughout practices and games. This keeps players physically active, increases their ability in a sport, develops communication, and, boosts their physical skills. Safety First – Safety in Y Sports is a primary concern, and we do all we can to prevent injuries from occurring. Sports are modified and taught at age-appropriate levels, and constant supervision ensures that training levels are gradual and that no unsafe activities occur. To be sure all program areas are safe for participants, medical waivers are collected, facility spaces are inspected to be sure they’re appropriate for the activity, equipment is frequently checked, and risk management plans are put in place from the beginning. Character Development – participants work together in a team atmosphere, they learn how to make decision, communicate, work on teambuilding, trust and build character. Youth Sports teaches kids to play by the rules, respect the game, and maintain an attitude of good sportsmanship. Intentionally teaches participants to follow the core values that encompass fair play, which leads to character development in each participant. Positive Competition – In sports, the pursuit of victory is kept in perspective. Adults make decisions that are always in the best interest of the participants, and the participants are more important than winning the game. Through positive competition participants learn to set individual goals, gain better understanding of winning on and off the playing field, and teach cooperation. Family Involvement – Parents benefit from participation in Sports as volunteer coaches, officials and time/scorekeepers. Family participation in the programs crates and environment conducive to open communication, volunteer work opportunities, positive role modeling, and relationship building. And when parents attend practices and games, they have the opportunities to become positive role models for the kids. Sports for All - Sports are welcoming to all, regardless of race, gender, age, or ability, and teaches participants to respect and appreciate all of their teammates. Y Sports encourages all those who participate – coaches, players, and families – to appreciate diversity. Sports for Fun – Sports strives to be fun and engaging, helping participants discover the enjoyment of learning and mastering skills, participating with friends, and competing.